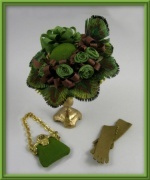 Last year, I received as a gift a simply adorable hand sculpted dollhouse baby. I found that it was sculpted by the incredibly talented Alicia Singleton. Alicia makes and sells her fabulous one of a kind sculptures on ebay and thru her website at alliebean.webs.com.Her one of a kind dolls are called Allie BeanDolls. After becoming an instant fan and collector of her work, and many purchases later, I had the realization that there is simply nothing available in molds for porcelain dollmakers with this much character and detail. We comissioned several original pieces from Alicia to be able to offer you the opportunity to make simply the cutest baby dolls ever!! Each mold contains two different heads, a torso and a set of limbs. We are introducing the first three doll molds, with more to be added in the future. The limbs are sculpted to be a set with the torso, but heads can be interchanged between the bodies so you can mix and match. Some mixing and matching of limbs is also possible in most cases. These dolls are super easy to pour, anda perfect painting project for a beginner! They are peg strung, and the head is attached to the torso in a unique manner that allows it to topple forward onto the chest just like a real baby. Babies measure a perfect 1 3/4" long. In addition, we have a mold of Alicia's special toys for the Belly Button Babies. Mold includes a darling bear and doll, both in two sizes and a bottle. I LOVE the little doll! All of the accessories are adorable with the babies! 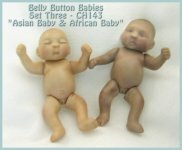 Belly Button Babies Mold - Set 4 THE BOYS!